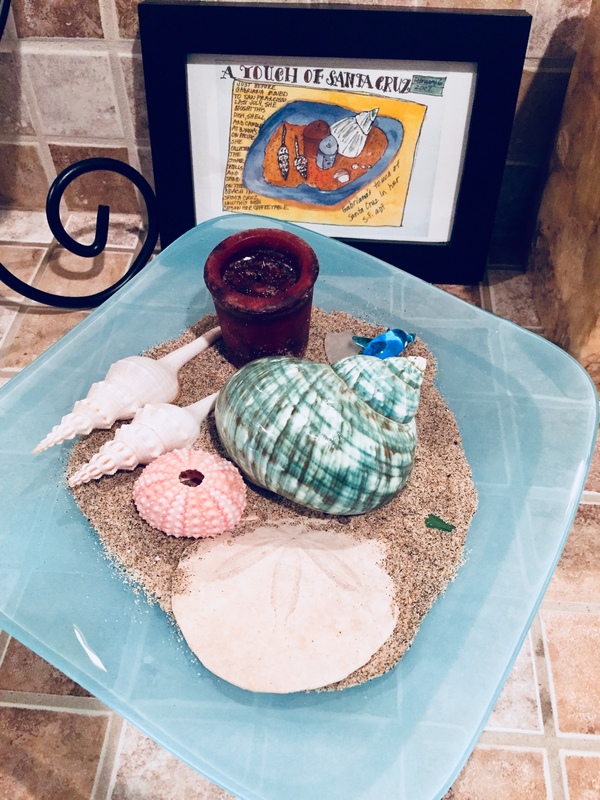 This turquoise glass dish filled with sand and shells reminds me of the beautiful beach town where I grew up. I found a couple of the shells and the square-shaped dish at a boutique I adore in downtown Santa Cruz. The bit of sand and other shells I collected at the beach. Mama created a watercolor drawing of my little handiwork and named it “A Touch of Santa Cruz” (featured in the back of the photo). This was my coffee table art at my first apartment in San Francisco more than 10 years ago. It now sits on my bathroom counter. After cleaning the dust from the dish and shells this weekend, I was reminded how much I love it — and how much I miss Santa Cruz and our friends there! Today’s #OneGoodThing was enjoying a touch of Santa Cruz with Mama! Can you spot the tiny glass dolphin peeking from behind the shell? Mama brought me that from her travels in Venice! Day 14 of 365. And Day 745 in a row (here’s the first 366 & the following 365)!